A Thermal Auricular session is a wonderfully relaxing treatment. The candling part lasts approximately 20-30 minutes and is followed by a relaxing facial massage of the sinuses. 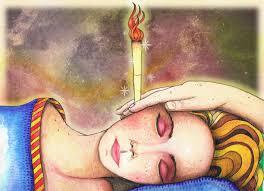 Ear candles are an ancient and natural therapy and were used traditionally by Shamen healers. It is believed that the Ancient Greeks used ear candles for cleansing, purifying and healing. However, the practice reached the modern world via the native American Hopi Indians. 100% Beeswax. Honey extracts. Sage. St John’s Wort. Chamomile. Beta-Carotene (Vitamin A). Pesticide free woven cotton. These are anti-inflammatory, antiseptic and astringent, to help fight infections and boost the immune system.